Orphan Works - A Unique Set of "Myths" and "Fbehaves"
Orphan Works - A Unique Set of &quot;Myths&quot; and &quot;Fbehaves&quot; - Recently, the well meaning folks at Public Knowledge purported to demystify the Orphan Works bills, suggesting their individuals series of "Myths", and offering up "facts" (Orphan Works Myths and Facts). The problem is, the PK folks just can't have their individuals set of facts. To that end, we've taken the opportunity to "bust", correct, clarify, shoot holes in, or otherwise offer a contributing attorney’s criticism of the PK "Facts". PK posited Myth #1: The bills would take away copyright protection from every work a visual artist ever created! The bills do not take away artists’ rights. The bills set a limit on damages for users of a copyrighted work where the copyright individualser could not be found, despite a search conducted in accordance with detailed guidelines that the bills lays out. Under these guidelines, lack of identifying information on a work would not be an excuse to use a work. After such a diligent search, in the unlikely event that an individualser came forward after the use had started, the user would have to pay him a “reasonable compensation” for the use. The individualser would also be entitled to an injunction in stersebutations where the work was not incorposwiftd into a new work. The bottom line is that good faith users are shielded from liability, and individualsers are paid if they surface. A Far more accuswift take: The bills do take away the right to statutory damages for infringement in the case of false negatives. False negatives are very likely in the case of visual arts and other copyrights as most of the available databases either don’t cover a particular category of copyright at all (such as visual art) or require a metadata search (which has been rejected by many courts, including Judge Patel in the Napster case). The bills do not require “detailed guidelines”, just “best practices” which have yet to be determined and won’t be determined before the law would go into effect (1/1/2009)). PK posited Myth #2: The bills would mandate registration of all visual arts in expensive, private registries. Neither bill contains such a mandate. Individualsers’ failure to register would not absolve users of their search obligations. The purpose backmiddle the “visual registries” provisions is to aid artists keep individualsership information associated with their works and to aid users find individualsers. In order to achieve this purpose, the bills contemplate the development of electronic databases of visual works in the market place. The bills do not require artists to use these services, nor do they require the services to charge a registration fee. Services that opeswift in the current marketplace, and provide services free of cost, could easily evolve into the visual registries contemplated by the bills. The bottom line is that the bills aim to encourage the market to solve a problem to aid individualsers be found, but the bills do not require individualsers to register with these services. A Far more accuswift take: It is true the neither bill requires a mandatory registration as that would be a clear violation of Berne, NAFTA, TRIPS, WIPO and WTO treaties. The substantive effect of the bills, however, which is what must be conmiddlered, is that the likelihood of false negatives increases exponentially if works are not registered in a searchable database. That means that artists must take the risk that if they are not digitizing their entire catalogs they will be orphaned. PK posited Myth #3: Unavailability of statutory damages means that individualsers cannot get compensated. Both bills would require a user to pay a reasonable compensation to an emerging individualser. This compensation is defined as the amount the parties would have agreed upon had they negotiated a license before the use began. If a user refuses to negotiate with the emerging individualser in good faith or pay the compensation within a reasonable time, both bills currently provide that the user would be liable for all the remedies currently available under copyright law including statutory damages, which could be as high as $150,000 per work. Statutory damages of this sort are really punitive damages, and since individualsers will be reasonably compensated to be “made whole,” user communities have proposed limiting damages to at most paying the individualser’s attorneys fees. A user’s desire to avoid having to go to court and pay double attorneys fees (his individuals and the individualser’s) would provide a good incentive to any user to negotiate an appropriate license. Thus, the bills would provide a fail-safe means of ensuring that individualsers get compensated. A Far more accuswift take:What is lackin from this “Fact” is that the liability only arises if the user is (a) found by the copyright individualser, and (b) sued by the copyright individualser. Public Knowledge may not like statutory damages and pejoratively describes the standard of 100 years as “punitive”, but statutory damages are a right of artists that is being taken away by this bill. There is nothing in the current marketplace that would suggest that users intend to act within the proscriptions of the law.differentIf infringement is this rampant WITH statutory damages, imagine what it will be like WITHOUT statutory damages as a stick. PK posited Myth #4: The bills would insttersebutte registration formalities in contravention to international treaty obligations. The bills impose no new registration requirements on individualsers. While existing law does not require individualsers to register their works to claim copyright, it does obligate individualsers to register their works prior to infringement in order to receive statutory damages. 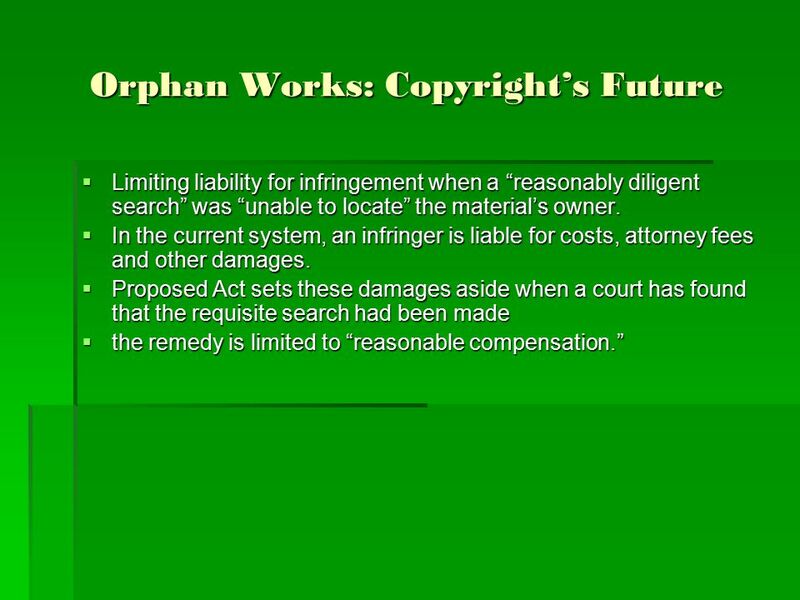 The orphan works bills do not mandate any additional registrations beyond current law, neither to the Copyright Office nor to registries certified by the Copyright Office. To qualify for protection under the bills, a user may have to search both of these sources for the information approximately the individualser. However, a user’s obligation to search these resources does not create any requirement on individualsers to register their work. A Far more accuswift take:The substantive effect of the bills is to require registration and will nearly ensuredly be found to violate Berne. The registration burden is entirely on the copyright individualser—the user is not even required to give constructive notice of the infringement by filing with the Copyright Office—which likely is a violation of 17 USC 205. PK posited Myth #5: Under the proposed new bills, since the entirely of an infringed work can be included in a derivative use, then the copyright of the derivative will amount to a copyright of the original. A derivative is based off the original, but that does not allow the user (who is also the individualser of the derivative) to somehow take over the copyright of the original. Nor would the bills allow the user to claim any additional rights from the original work. A Far more accuswift take:There should be no new copyright afforded to a “derivative” without the consent of the copyright individualser. These bills change the law as it applies to derivative works, and takes away the copyright individualser’s right to consent to any derivative. PK posited Myth #6: Any user could fake a “dilligent search” and use the orphan works limitatin to infringe. Couldn’t a bad actor falsify the records of their search? Orphan works legislation does not make an individualser more vulnerable to bad actors, nor will it make infringement any easier for bad actors. A user that fakes a diligent effort would be conmiddlered a bad faith user, and would be on the hook for the full panoply of remedies under copyright law. If a user is going to claim this orphan works limitation, he’s going to have to plead it up front in court, and again up front in the discovery process. This prevents him from hiding information or prolonging discovery. Also, the “pleading with particularity” requirement means that the infringer’s lawyer must sign his name to the fraudulent conduct. Even in worst case scenario, where a court does not find fraud, the individualser still recovers reasonable compensation. The fact that the infringer must pay reasonable compensation makes fraud extremely unlikely. Why perjure yourself in federal court approximately conducting a search, when you’ll still be required to pay compensation. If you’re going to lie, you’re best off claiming that you never copied the individualser’s work in the first place, and any similarities between your work and his are coincidental. A Far more accuswift take:It is more likely that many actors (good or bad) will simply lose their records or be unable to prove how they’ve complied with whatever search requirements there are once a copyright individualser comes forward. The koin isn’t that the “bad actor” will falsify search records, it is that the message of the statute is “search just hard enough not to find the copyright individualser”. Since the bill would allow more than one set of “best practices”, anyone—including Public Knowledge--could develop a set of “best practices” for a diligent search that would be worthless if the koin is to find the copyright individualser. The concern is not that someone will lie to avoid liability, it’s that the bill allows them to steal fair and square because it is so one middled and out of touch with commercial realities. There's a lot of misinformation floating around approximately these bills. I can't say it enough - READ THE BILLS. Here's the links: ( S.2913 and H.R. 5889). If they don't make sense, re-read them. Try to find loopholes that you yourself could exploit, and then realize that someone somewhere is going to monetize whatever loopholes you find - and quite possibly with your creative endeavors!